Courts have an interesting relationship with the law. On one hand, they have little or no control over what laws are put in place, yet they must deal with those that are enacted, whether they like them or not. So it is with Moore’s Law which states that the number of transistors on an integrated circuit doubles every two years. What Moore’s Law means is that the raw power of information technology – the engine that drives it – is doubling every two years. An ancient tale illustrates the implications of Moore’s Law. 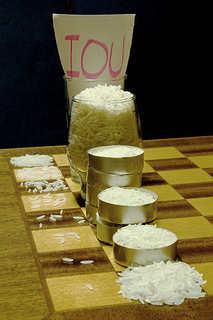 The tale is that a king, being grateful to a man for some service, offers him “anything he wants.” The man produces a chessboard and tells the king he wants one grain of rice on the first day on the first square; double that (two grains) on the second day on the second square, double that (four grains) on the third day, and so on, through the 64 squares on the board. For the first couple weeks, the man got hardly enough rice for a few spoonfuls. Assuming approximately 7,500 grains to a cup, he finally got nearly a cup after about two weeks (13 doublings). In another week though, he was entitled to over 55 pounds THAT DAY. By Day 27, his entitlement was 1.75 TONS of rice. And he wasn’t even half done. Much has been written about the implications of Moore’s Law in all facets of life. When one considers that the fundamental activity and purpose of courts is to process information, a couple things become clear. One: Extrapolating backwards, Year Zero of Moore’s Law is about 1960. That means that as of 2014, we’ve been through about 27 doublings. Information processing power has increased over 67 million times since Dwight Eisenhower left office – from a single grain of rice to almost two tons. What matters is not the number. What matters is what that increase in information processing power has meant – from space travel to smartphones to the Internet to ankle bracelet prisoner monitoring to “Paperless” courts to shirts that know when they need to be washed and tell the washing machine at what temperature to wash them. Two: The other thing that matters is that, if we were talking about grains of rice, after the 27th doubling we’d have several tons. A lot to pile on a chessboard; yet we can still comprehend it. But between the 27th and 32 doublings – that is, the next ten years – the rate starts to really matter. In terms of rice, that’s around 56 TONS. So we come to the really important point: Despite everything that’s happened with regard to technology and change in the courts over the past 55 years, THE REAL IMPACT OF TECHNOLOGY HAS NOT YET STARTED TO HIT THE COURTS. Our descendants will, in all likelihood, look back on the late 20th and early 21st Centuries as the “early” stage of information technology development. Technology, of course, doesn’t comprise the total universe of change. Laws, for example, change at a rate far less dramatic than transistors on a circuit. Nevertheless, technology is driving up the rate of change of just about everything, INCLUDING laws. We can easily expect to see as much change in the next five years as we have experienced in the past 20 years. To understand what that means, consider that 20 years ago, almost no one knew what the Internet was. The slope of an asymptotic curve becomes increasingly slippery as it approaches vertical. Courts and their political jurisdictions to whom they are responsible should be making ongoing rule-making, process re-engineering, and change management a top priority, not an afterthought. Do you really think Moore’s Law is going to hold up through the next 10 years? Absolutely. Quantum computing alone will more than sustain it. Nanotechnology and organic systems are also pushing it. While it’s possible it could accelerate, the engineering will probably restrain it to the biennial doubling.